Aquaculture, is a term that broadly refers to the cultivation of aquatic plants or animals for food. While there are many unsustainable aspects of these practices, there are also more sustainable ways to conduct aquaculture. 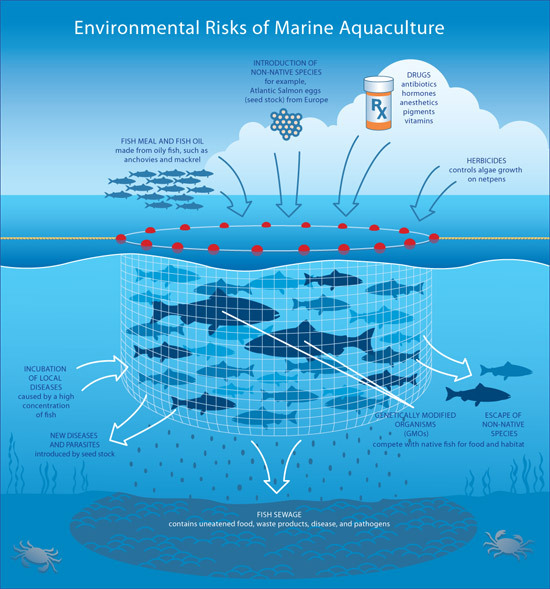 Some of the largest environmental concerns stemming from aquaculture relate to the feeding practices of the fish. One of the largest steps that fisheries can take to be more sustainable is to work towards using plant based feeds, instead of meat based feeds (“Sustainable Agriculture”). This helps to prevent issues of overfishing for feeder fish and excess waste. Many of the fish produced in fisheries are used for feeding carnivorous fish in other fisheries, which requires a lot of resources (Moraes, 2012). Switching to a higher percentage of plant-based feed can eliminate some resource depletion. An additional step aquaculturists can take, is to reduce the amount of antibiotics and pesticides that are used in their practices. Often these chemicals leach into adjoining waters, and causes issues for ecosystems. The overuse of antibiotics can also lead to antibiotic resistance, and destruction of necessary bacteria (Romero, 2012). This can be done by relying on more natural solutions, such as administering probiotics, essential oils and phage therapy (Romero, 2012). Another concern with aquaculture, particularly in the Philippines, is destruction of marine ecosystems for the creation of fisheries. Often mangrove forests are destroyed for fisheries, which is extremely deleterious for local communities. This is because of the wide range of ecosystem services that mangroves offer including, protecting from natural disasters, filtering out toxins and proving important habitats for marine life. Habitat destruction ultimately hurts those whom live in the area, because it leads to major losses in the amount of fish, which resultantly limits the amount of income. By making sure that fisheries are placed in areas that are minimally impacting the environment, it helps everyone (“Sustainable Fisheries Management and Marine Conservation Oceana Philippines Policy Brief”). This can be done through regulation and creating marine protected areas and having strict enforcement of these protected areas. Educating communities about the importance of sustainable fisheries is also an important step in preventing illegal fisheries and exceedingly unsustainable practices. You can help by donating or volunteering to Enhance a Village! We work to help eradicate poverty, through education, introducing new farming practices and increasing access resources in the Philippines, click here to learn more.